The old adage goes something like this; if you ask a cobbler to solve a problem he will give you a solution that involves the stitching of leather. Ask a farrier and he will give you a solution using iron. If this thinking can be applied universally then how would the building industry respond to the challenge of building the most energy efficient house? If you talk to a heating and cooling contractor he or she will tell you that energy efficiency starts with the mechanical systems in your home. 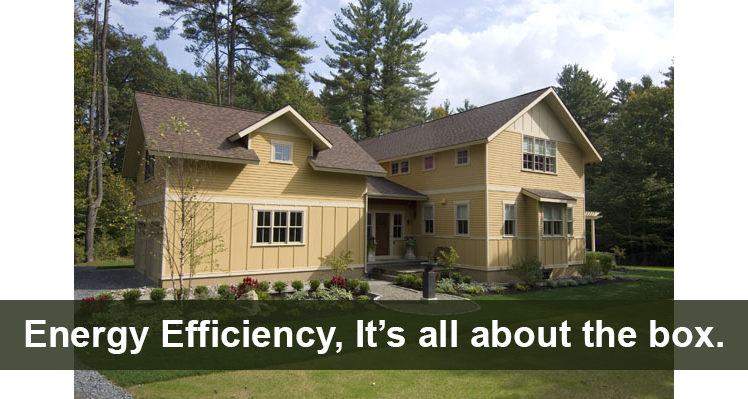 A 97% efficient boiler is considered a better investment than a 92% efficient boiler. Talk to an electrician and he or she will recommend that you invest in energy efficient light bulbs and appliances and/or install solar panels to harvest the sun’s energy. So how would a carpenter respond? Well, speaking for myself, a carpenter with over 40 years of experience in the field, I would say this; It’s all about how you build the box. It’s my experience that it doesn’t really matter how efficient your boiler or your appliances are if the house itself is drafty and leaks heat to the outdoors due to poor workmanship and little or no attention to air sealing techniques. There’s no point in investing in a high performance boiler if the heat is being sucked out of the house through unsealed cracks where framing members meet or holes through which wires and ducts pass. Air leakage is measured by conducting a Blower Door test and a Duct Blast test. Both testing mechanisms measure leakage in a house and in the case of a Blower Door test it is measured in Air Changes Per Hour ( ACH ). Building Code requires that the maximum number of air changes per hour for a house built in 2014 cannot exceed 7 ACH. The Energy Star maximum number of air changes per hour is a bit more stringent at 4 ACH. Capital Construction recently completed a new house at in the Saratoga Subdivision, Louden Ridge, and got a blower door reading of 1.35 ACH. This is more than 5 times better than what Building Code requires and almost 3 times better than the Energy Star standard. At Capital Construction we seal penetrations and framing junctures methodically and systematically. We consider the whole house and how all the parts fit together to make a more efficient box. We caulk and seal anywhere that shrinkage could occur over time or where parts fit together such as at the juncture of an exterior wall and floor framing members. If it’s true that energy efficiency starts with how you build the box then it’s also true that if you build the box with attention to detail it will be green or, as I like to say; Build it right the first time and it will be durable, long lasting and energy efficient.